The Yacht Barn - The Home for Wayward Boats and Boaters!The Yacht Barn | The Home for Wayward Boats and Boaters! Fun, challenging sail at Council Bluff today. The kick up rudder head was falling apart so I re-epoxied last night. Of course that meant I had to sacrifice mowing time to test the rudder out today. Darn!! Sunday, I took the FJ, the latest addition to The Yacht Barn armada, out for the first time. We went to a small nearby fishing lake, that has probably never seen a sailboat 🙂 As I was packing up to come home, a couple came to see “the guy with a sailboat on Bismarck Lake”. Apparently, our picture had already made it to Facebook! The latest addition to the stable – International Star Class racing yacht! This boat is Star #6860. She came with “three back sails, and two front sails” according to the owner. She is a Mader (Germany) boat, and was manufactured in the early 1980’s according to my research. The sails look to require cleaning and maybe a few small patches, but are otherwise crisp and serviceable. I would assume anyone serious about racing would want new sails. The galvanized trailer is in great condition, including working brakes and lights. It could certainly use new tires, but there is a like-new spare. I don’t intend to actually sail this boat (although it could happen), but instead bought it as an investment. She is for sale, as-is, where is – for $2,000 OBO. If needed, I could part out the boat and trailer. 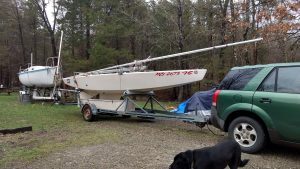 She did not come with a title, but I am in contact with the previous two owners and will be working on getting a MO or FL title for both the boat and trailer. My initial plan was to glue the 1/16 in. by 1 in. 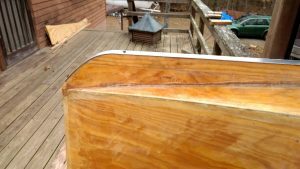 flat aluminum stock onto the keel with Liquid Nails, using a few drywall screws to hold temporarily. However, after a 24 hour cure, the Liquid Nails is still soft, and isn’t going to hold. So, I’m leaving the screws in for now. Check out our early November adventure! San Juan 23 Singlehanded Sunday Sailing! Finally got back to Florida, and we were able to go sailing this weekend! Sharon, Adam, Bekah and I had a good time sailing for a couple hours in the bay, after having to do some remote work from the club porch for a client back in Missouri. We had a great time, but I’m not sure we got any pictures! Sorry about that. We left the boat in the water at the NEW floating dock for the night, and the next day (Sunday) I went back up by myself. I was able to get about 3 hours of sailing in, solo, and learned alot about Juanita. The main thing I learned is that she sails GREAT! No offense to Eeyore, but there’s just very little comparison. I am thrilled!